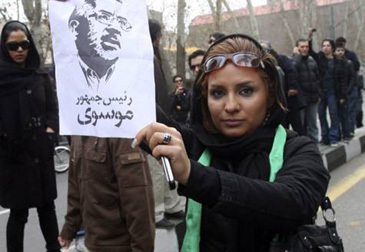 A female Iranian protestor holding a poster of opposition leader Mir Hossein Mousavi, during anti-government protest in Tehran, Iran, on Dec.27 in this photo provided by the Associated Press. DUBAI- Dubai TV's Iran correspondent Reza Al Basha has been detained by Iranian authorities, Dubai Media Incorporated (DMI) has confirmed. "Iranian authorities have confirmed that Al Basha has been detained as of on Dec. 27" Gulf News reported quoting Ahmad Al Shaikh, Managing Director of DMI as having said. "We are working through our news centre in Tehran to resolve the matter with the concerned authorities.."
Dubai TV lost contact with Al Basha on Sunday. The 27-year-old Syrian has been out of contact since 11am on Sunday when he called his family to tell them he was caught up in downtown Tehran. It is believed that he is among the 300 people who were arrested during the violent clashes between government forces and protesters on Ashura, the tenth of Muharram. A colleague of Al Basha, quoted anonymously by AFP, had said that he was told by the Foreign Press Bureau that Al Basha was not among the dead or injured "so he has most likely been arrested". Al Basha is a resident journalist in Iran and has been working for Dubai TV for a year. Reporting from Iran has become increasingly difficult since the contested June elections, as foreign journalists have either been barred from entering the country or have been ordered to stay indoors when protests erupt. While the media blackout has been effective in keeping foreign journalists out of the country, many news outlets have found ways around the ban. A quick scan of all the datelines in news stories on Iran in the past few months will reveal that many of them are not reported from the Islamic Republic. Left with few choices, most foreign news outlets have instead resorted to citizen journalism from social networking services, websites of opposition sources in Iran, and even text messages. CNN has had one of the most effective citizen journalism programmes, where Iranian viewers in Tehran have been sending reports and videos to its iReport show. While this is a method that has been emulated by other networks, it has been criticised as lacking in credibility, especially since some breaking news reports have proven to be false, including reports about the alleged house arrest of opposition leader Mir Hussain Mousavi.